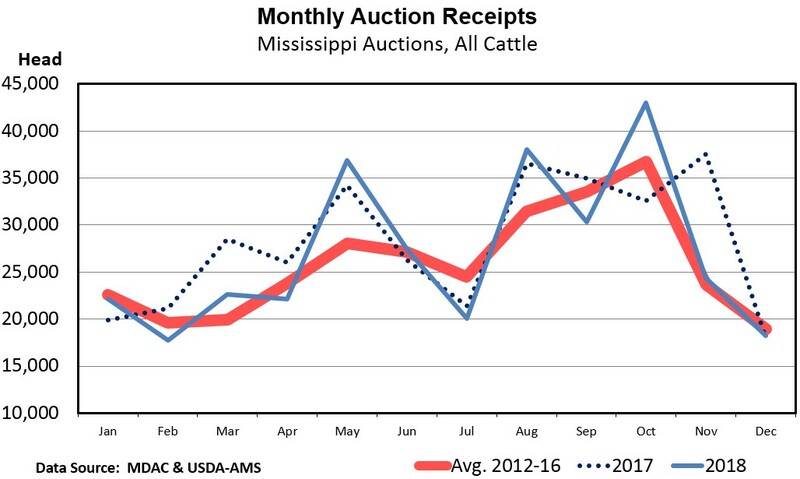 Approximately 323,000 head of cattle ran through Mississippi auctions in 2018 according to data from the Mississippi Department of Agriculture and Commerce and the USDA Agricultural Marketing Service. This was down about four percent from 2017 but about four percent higher than the 2012 to 2016 average. Sales in the early months of 2018 were lower than during the same months of 2017 as shown in the graph. This was likely impacted by the low calf prices in late 2016 which led many producers to hold their calves until prices recovered. While these numbers are for all cattle, the data also allow for a little more detailed look at specific classes. More than half of the cattle were steers with a 2018 total of about 185,000 head. That was down about six percent from 2017 – but again remember that 2017 likely included more carryover calves from 2016. On average, about 57 percent of the cattle sold at auctions for a given week were steers. Most cattle sold were calves with 65 percent of receipts being for cattle weighing less than 600 pounds. Cows accounted for about 12 percent of auction sales in 2018 with total sales at approximately 38,000. This number includes only cull cows. The 2018 total is about the same as in 2017, but it is interesting to note that 2018 cow sales were 13 percent greater than the 2012-2016 average. August, September, and October are the primary selling months in Mississippi and around the U.S. October saw the most volume in Mississippi in 2018 with 43,000 head sold. February and March are usually the slower months of the year. That is likely to be the case in 2019 since there was not a lot of price pressure in the Fall to encourage producers to hold calves until the spring.